Like all the other IPL teams RCB retained all their main players from last year’s squad. 12 indian and 8 foreign players has been retained keeping the team balance and chemistry. Virat Kohli remains the highest paid IPL player after he was retained by Roayal Challengers Bangalore. Kohli is not the only top Indian player retained, RCB has kept the likes of Mandeep Singh, Kedar Jadev, Stuart Binny, Sachin Baby and KL Rahul. While oversees players like Chris Gayle, Ab De Villiers, Australia bowler Mitchell Starc and Adam Milne also retain their positions in the 2017 squad. Royal Challengers Bangalore IPL Auction Results: RCB had to overhaul their auction strategy after Mitchell Starc withdrew at the last moment. However they went in and bought highly rated bowler Tymal Mills for (₹12 crore) followed by two decent domestic players in Aniket Choudhary (₹2 crore) and Pawan Nagi (₹1 crore). Below is the entire squad of RCB for 2017 season. Owned by Indian tycoon Mr. Vijay Mallya, Royal Challengers Bangalore has kind of under-achieved having never won the Indian Premier League title in the first 8 seasons. They did qualify for the finals in 2009, 2011 and most recently in 2016 but failed to pass the final hurdle. This year they have a very solid batting lineup as they retained all their key players from 2016 squad. Lets take a look at Royal Challengers Bangalore squad. RCB 2017 Auction Results: The IPL auction will take place on Monday, 20 February 2017 and we will be updating the Royal Challengers Bangalore squad right here with live updates. Once the auction is completed we will replace this page with the squad format with all the details of new players bought and retained players salaries and some career statistics. What to expect from Royal Challengers ? They have probably the strongest batting lineup of all eight teams but they lack depth and cutting edge with in their bowling department. 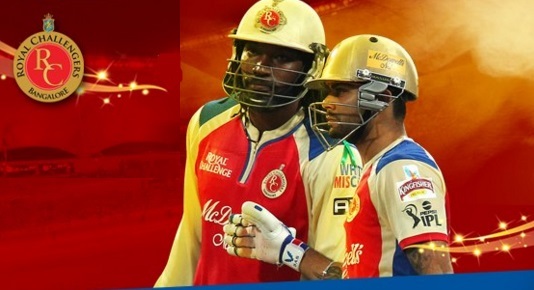 Chris Gayle, AB deVillers and Virat Kohli are capable enough to win games single handedly and RCB will be there and there about in the knockout stages. what abt KL RAHUL ?? RCB is super team . Please took stocks yrr KOHLI you know better what he can do….